Scour user reviews on sites like Amazon and you'll struggle to find a headphone as highly lauded as the Audio-Technica ATH-M50x. The only major bummer about that iconic set of cans? They're still tethered by a cable in our undeniably wireless mobile audio environment. Audio-Technica is rectifying that situation with its new ATH-M50xBT, which--as its designation implies--adds Bluetooth to the equation in the form of BT 5.0 with aptX and AAC codecs. Perhaps the most astounding thing about the ATH-M50xBT isn't that it takes a tried-and-true design into the wireless realm, though; it's that it does so with a staggering 40 hours of listening on a single charge. Of course, that's largely down to the fact that it relies on passive noise isolation rather than active noise canceling. 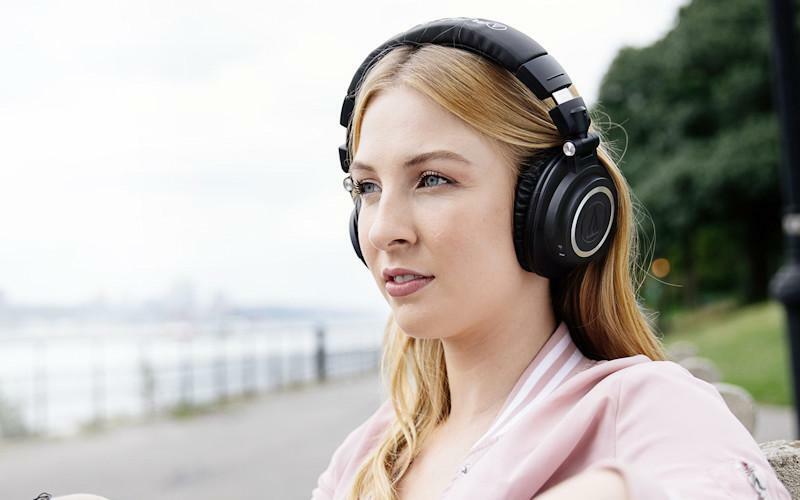 Audio-Technica today announced the introduction of its ATH-M50xBT wireless over-ear headphones, which bring Bluetooth wireless technology to one of the world's most acclaimed pro audio and consumer headphones. "Although our M-Series models were originally designed as professional studio monitor headphones, they've crossed over into the consumer market to the extent that they've become a favorite of music listeners worldwide," said Bob Peet, Audio-Technica U.S. Marketing Manager. "The ATH-M50xBT offers the same sonic signature that has made the ATH-M50x an audio industry standard, along with the convenience of on-the-go wireless operation." The closed-back ATH-M50xBT delivers an exhilarating wireless listening experience with exceptional clarity, articulate, extended bass and smooth, wide frequency response. Its 45mm large-aperture driver, which has the capability of a 15 - 28,000 Hz wide frequency range, is employed to deliver studio-quality sonic accuracy and musical enjoyment. Rare-earth magnets and Audio-Technica's copper-clad aluminum wire (CCAW) voice coils are the same as those used in the original ATH-M50x. The ATH-M50xBT utilizes Bluetooth 5.0 and is compatible with aptX® and AAC codecs for the best-possible wireless audio reproduction. An internal battery provides up to 40 hours on a full charge (a USB charging cable is supplied), allowing users to enjoy the headphones' high-fidelity wireless sound without interruption. In addition, the headphones can be used in wired mode for use with devices that have a wired connection or when battery power is low. The ATH-M50xBT retains the robust construction, fold-flat design with 90-degree swiveling earcups, and professional-grade earpads and headband of the ATH-M50x, with the addition of controls mounted on the left earcup for easy handling of phone calls, music playback and volume adjustment. In addition, a convenient touch control provides easy access to a smartphones' voice assistant technology. The ATH-M50xBT is also compatible with the Audio-Technica Connect app for iOS and Android, which provides an array of convenient tools and features. The ATH-M50xBT comes with a 1-foot USB charging cable, detachable 3.9-foot cable with mic for wired operation and a handy carrying pouch. The Audio-Technica ATH-M50xBT headphones are now available for US$199.00. • Visit the Audio-Technica website for more product information. • Audio-Technica Introduces ATH-SR6BT Wireless Headphones at HomeTheaterReview.com. • Audio-Technica ATH-DSR9BT Wireless Headphones Reviewed at HomeTheaterReview.com. Please support HomeTheaterReview.com’s free content model by purchasing your AV gear (or other stuff) via Amazon.com. We get a few bucks here and there, which helps us create more and more top-level reviews and content for you to enjoy!